There are 3 flowering plants of walls that commonly grow around here and are all garden escapes. 2 bellflowers (Campanula poscharskyana and Campanula portenschlagiana) and Ivy leaved toadflax (Cymbalaria muralis). 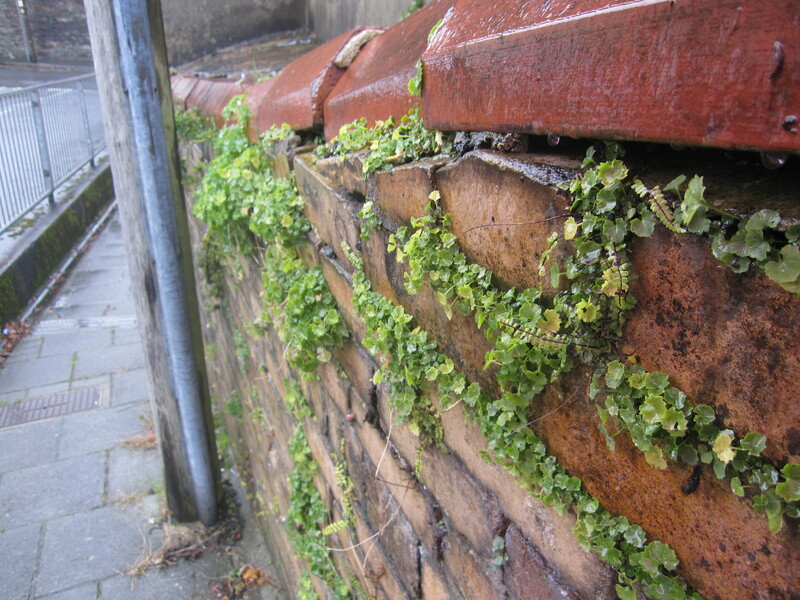 Small plants growing in crevices between the stone or bricks can look fairly similar when no flowers or mature leaves are present. All 3 have leaves with cordate bases and smaller leaves are generally round/ orbicular with varying amounts of indentations/ lobes. 1 Leaves (upper surface), leaf stems and flower buds with many hairs that are easily visible to the naked eye. 2a No white sap present in main stem. (Gently pulling the stem apart may reveal a central core of vascular strands). Leaves often purplish below without noticeable venation.